Cowboy boots are in fashion all year around. Tex Mex is probably the best food ever!! Tacos, enchiladas, guacamole, fajitas, salsa – we Texans love it all!! Mostly because it can be so vegetarian friendly! While it does taste absolutely delicious and indulgent, it often does not score high on the healthy scale. Recently, I’ve also been trying different ways to incorporate Tex Mex flavors into more healthy recipes. 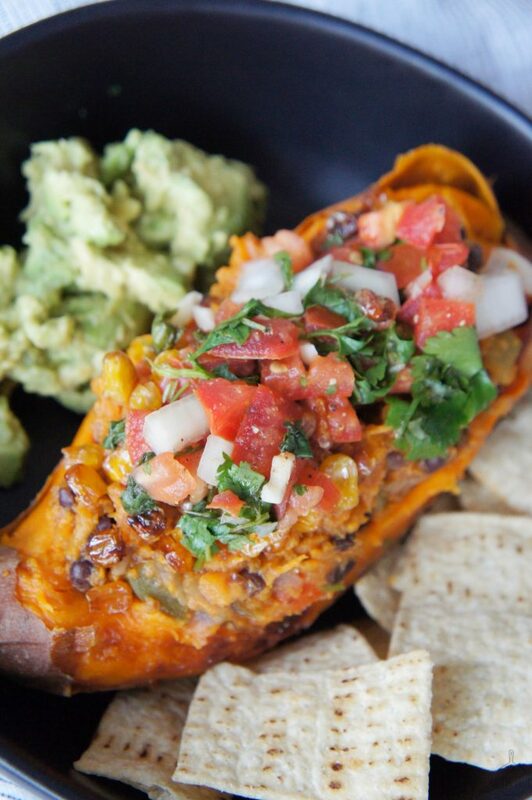 This Tex Mex Stuffed Sweet Potato recipe is one of them. 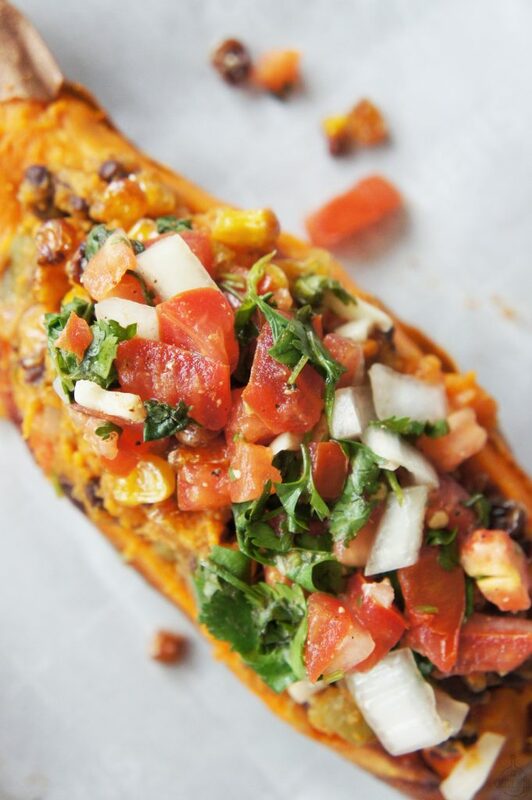 A delightful baked sweet potato, stuffed with spicy black beans, roasted corn and then topped with pico de gallo. All the flavors of a typical Tex Mex dish with a healthier take. Here is a healthier twist with some of my favorite Tex Mex flavors. 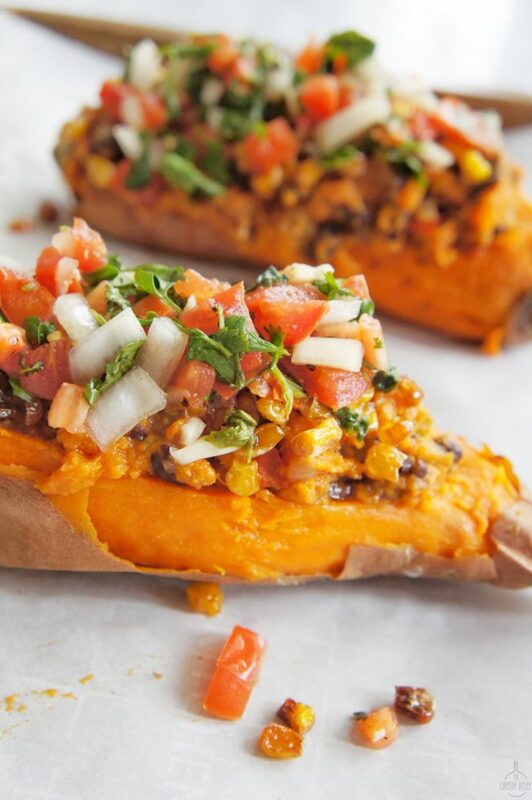 Delicious baked sweet potatoes topped with black beans, roasted corn and pico de gallo. 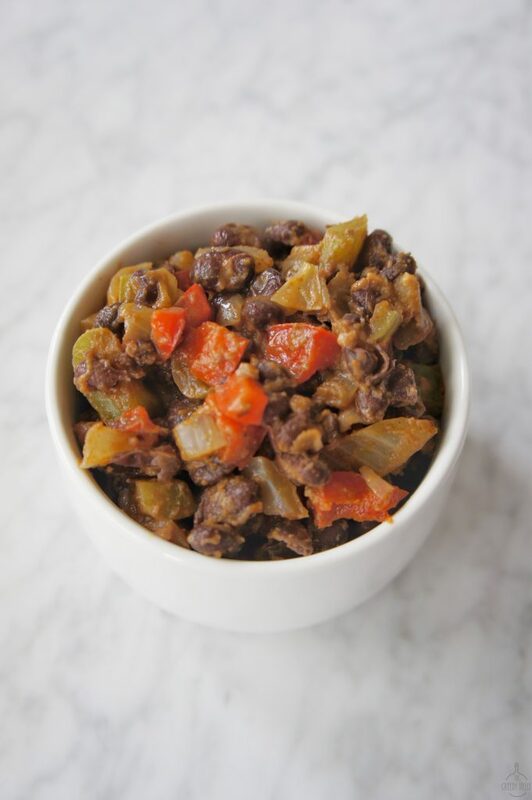 You can easily prep the components in advance for a quick and delicious meal! Scrub the sweet potatoes clean, pierce them with a fork in a few spots for even cooking. Line a baking sheet with parchment paper, place the sweet potatoes on the baking sheet and bake in the oven for 45 minutes. While the sweet potato roast prepare the other components. Add the onion, garlic, jalapeño and sauté for 2 minutes. Add the black beans, cumin powder, cayenne pepper, salt and a dash of hot sauce. Cover and let it cook for 5 minutes, stirring intermittently. 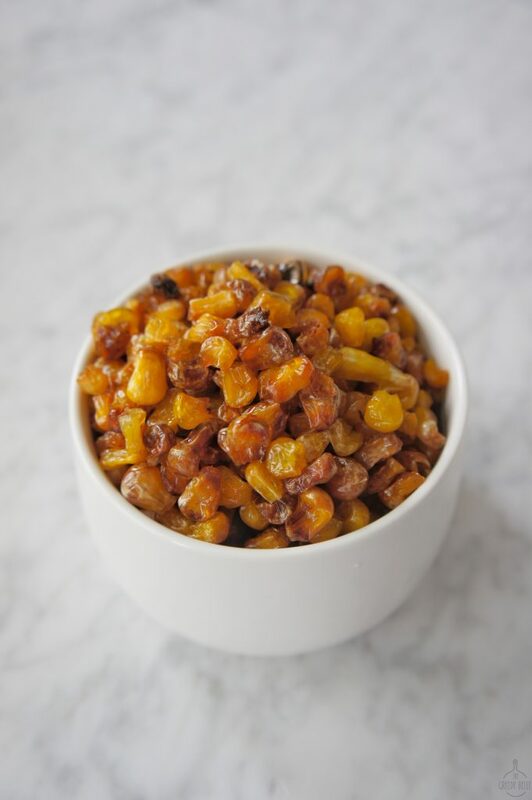 Place the corn in a single layer in another baking sheet. Bake in the oven at 375 degree Fahrenheit along with the sweet potato for 15 minutes. 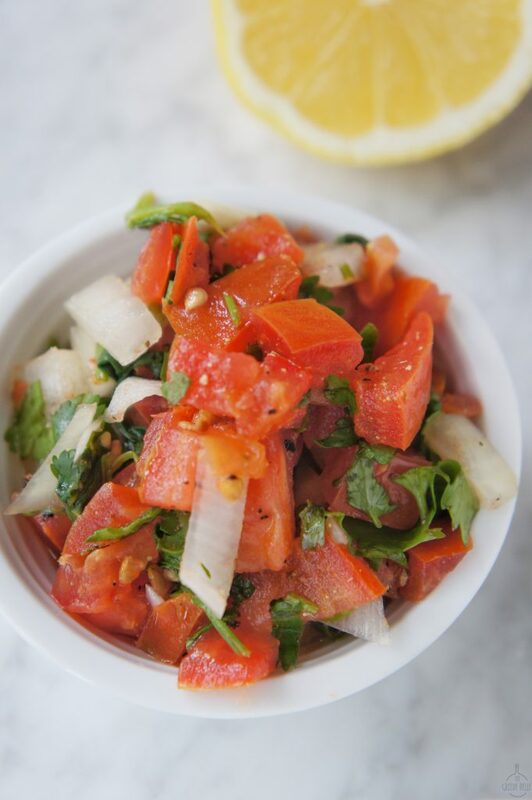 In a medium size bowl mix the onions, tomatoes, cilantro. Add the lemon juice, salt and crushed black pepper. 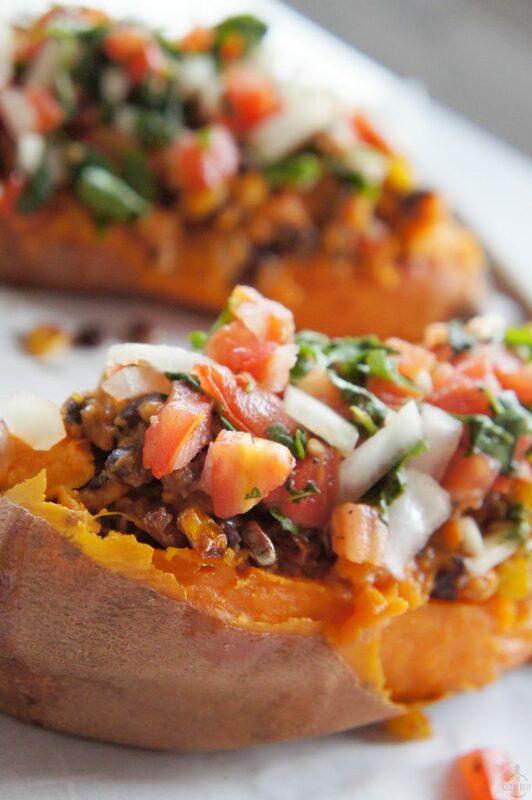 Once the sweet potatoes are baked, remove form the over and let them rest until they are cool enough to handle. Make a length wise slit on the sweet potatoes. Peel some of skin and scoop out about 3-4 tablespoons of the sweet potatoes. Add the scooped out sweet potato flesh to the black bean mixture. 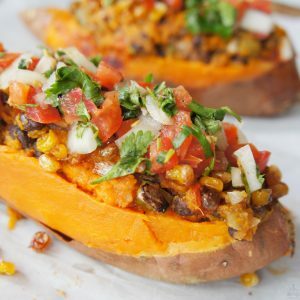 Top the sweet potatoes with the black bean-sweet potato mixture, roasted corn, pico de gallo and serve.